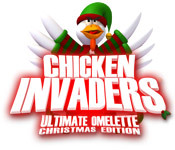 Chicken Invaders: Ultimate Omelette Christmas Edition is rated 4.2 out of 5 by 10. Rated 5 out of 5 by zaidnaser from adventure it's a really cool website i love it. Rated 5 out of 5 by Altmoabit from don't eat chicken, shoot them!!! 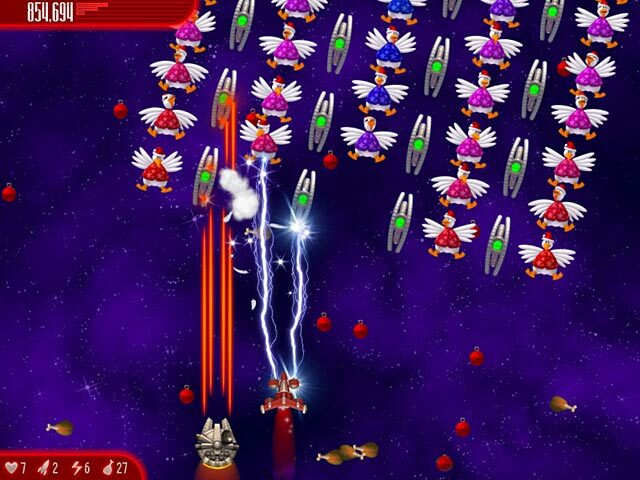 You have a spaceship and fly around in space as you come across invading chickens. You shoot them and they give you in return chicken legs and upgrade power. Now your ship gets bigger fire power and can let those chicken legs really fly.It has the very old fasioned feel to it, to the point of being cool again. Sound effects are not bad either. If you get past the fact that you are shooting and killing innocent looking chickens, then you can enjoy the sillyness of this game.The levels get pretty challenging fast. What fun!!! Rated 5 out of 5 by Rescue_helo from Hilarious to the 10th power If you have never played any of the Chicken Series, try this one. You will ROFLYHO (H for "head"). Guaranteed. This latest installment is actually a bit more difficult than the previous ones, thus offering a good level of challenge. I am certain you will appreciate the developers' sense of humor because it is just irresistible. First the concept which is not only original but also totally zany; one might even say "ridiculously funny": hordes of chickens from outer space invading the Earth ! A simple idea but very effective. Then the introduction which I will not unveil lest I spoil your fun in so doing. I loved the cute little spaceship, the reactions, comments, and behavior of its pilot, the voice-over, and the stupid happy look of those chickens ballet dancing before being turned into burgers. Even the title: Ultimate Omelette ! LOL. 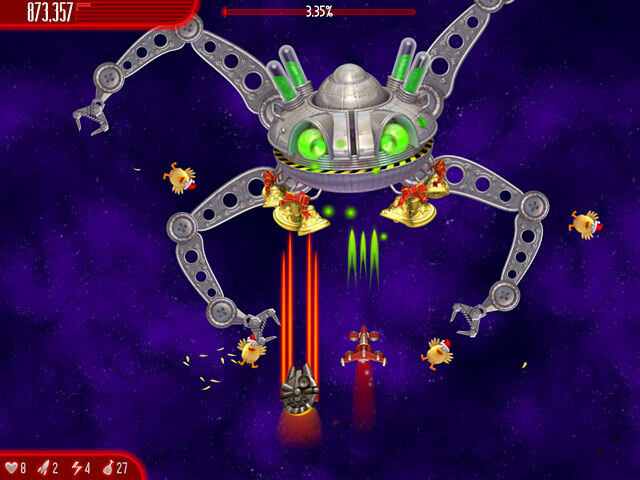 It's a shoot'em up, and, obviously, like in all shoot'em ups every sequence is but one variation on a theme. This means that the degree of repetitiveness is high, but the fairly wide choice of weapons, the different types of crazy ballets, the powerups and collectibles, combined with the fact the game doesn't take itself seriously, and above all the omnipresent humor, turn what could have been a bore into a highly enjoyable experience that brought tears to my eyes of too much laughing. Now, of course, it is true there isn't much difference between this edition and the previous ones, basically. Just a few new twists. So, if you have played the others in the series you might not be tempted by this one. Nonetheless, there are so few hilarious games around that why not have a real good laugh for a few hours ? I own the Easter Edition -although I usually never go for arcade games- and I think I'll get this one too, simply beacuse it is very funny. Rated 5 out of 5 by Jossele from Very funny! I don't like these kind of games at all - since there are no hidden chicken -, but this one is just funny! Rated 5 out of 5 by Oedesh from Chicken Invaders - Ultimate Omelette X-mas!!!!!!!! Hahhahahahah very funny game!!!!! You'll have FUN playing it and laugh too!!!! A real game for christmas dinner!!!!! I loved it!!!!!! Only CHICKENS!!!!!!!!! Rated 4 out of 5 by melisae from Great Series I love the Chicken Invaders series and have bought most of them. 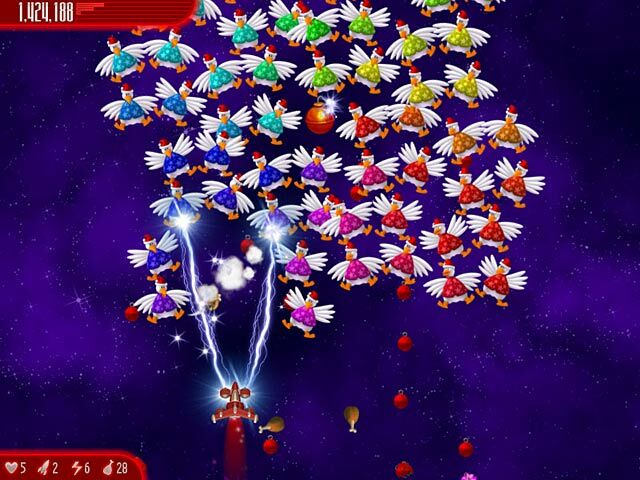 However, the Ultimate Omelette Christmas Edition is pretty much Chicken Invaders 4: Ultimate Omelette only updated to a Christmas theme. That said, the game play is challenging (no, this is not easy, you will die and often), fun and addictive. I like to run through first on the Veteran level and then go back and play at the Superstar Hero level. It's a great investment as the replay value is very high. Rated 2 out of 5 by ddaleddale from Chicken invaders Christmas Edition if you played one you played them all...nothing new, nothing exciting...put some wreaths on the chickens and dropped some xmas bulbs...save your money...not worth it!! !